Mayor Ted Wheeler says vacate notices to be posted at Macadam Avenue immigration center on July 23. 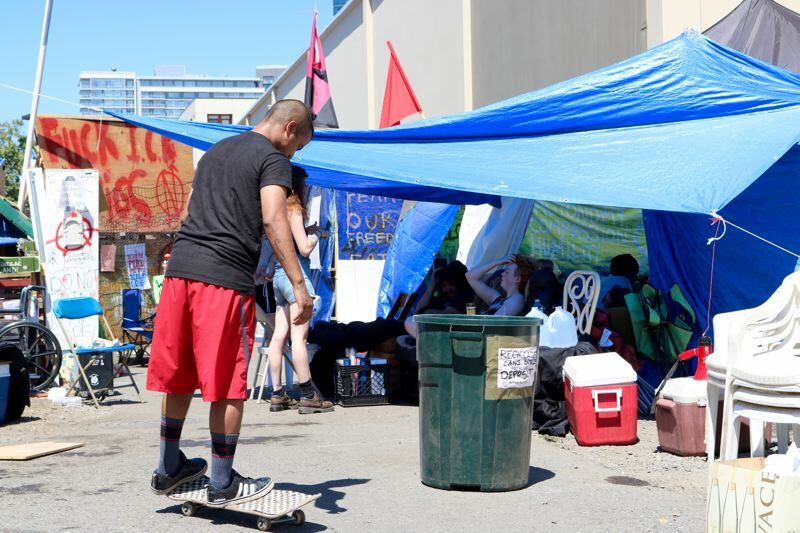 A major group at the Occupy ICE camp is heading home — and stragglers have been ordered to pack it up as well. 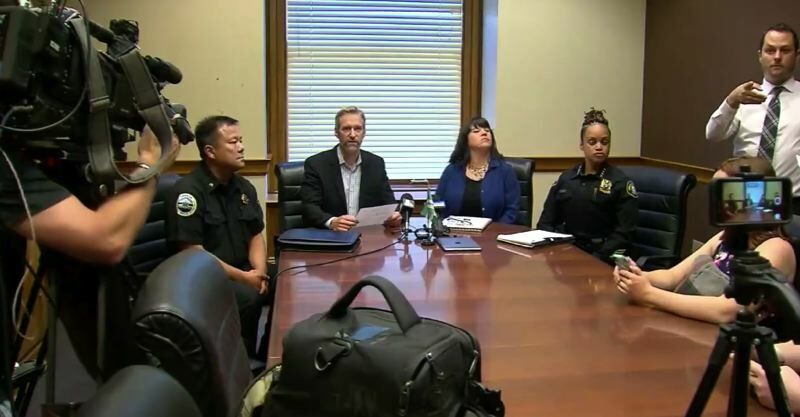 Portland Mayor Ted Wheeler said vacate notices would be posted on Monday, July 23, at the tent city surrounding a U.S. Immigration and Customs Enforcement detention facility on Southwest Macadam Avenue. "The timing is right," Wheeler said. "What we're asking people to do today is peacefully disengage." 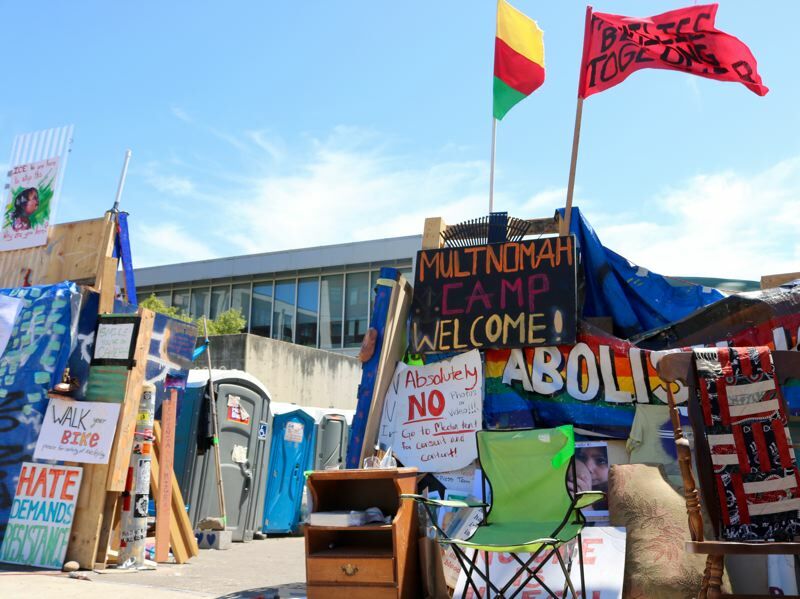 While he had previously vouched that the Portland Police Bureau would not interfere with demonstrators on federal land, Wheeler noted that the encampment is now located entirely on private property and plots owned by the city of Portland and the transportation bureau. He said his primary concern is maintaining access for cancer patients to Oregon Health & Science University — not the news that occupiers had forced a nearby nonprofit coffee cart to close over the weekend. "We will continue to support the safe expression of first amendment rights," Wheeler added. "The camp itself with the wooden structures is not sustainable." Commissioner Chloe Eudaly — who megaphoned her support for the camp from the steps of the ICE building during the first days of the protest — said there are two factions at the camp, #OccupyICE and #AbolishICE. "Abolish ICE is more representative of individuals from that impacted community, and they have publicly state that occupation is a tactic and not a strategy," she explained. "We should be listening to the voices of the people who are most impacted." Wheeler declined to say what he will do if some of the protesters refuse the city's order to vacate. He said he has never walked through the camp but only driven past it. The #OccupyICE protest sprouted five weeks ago in response to federal immigration rules that separated parents from their children when they were caught illegally crossing the border. President Donald Trump has officially rescinded that policy. At least 21 people have been arrested during sometimes heated confrontations with Federal Protective Service and Department of Homeland Security police. Far-right leader Joey Gibson conducted a mostly peaceful visit with his band of Patriot Prayer members on Friday, July 20. In an email, #AbolishICE said it would continue to hold vigils at the ICE facility. "With humility, we acknowledge that this fight has been fought long before us, and we have much to learn," the group said in an email. "This move will decentralize the movement and allow it to exist indefinitely."